How to deal with car salesmen: part 3 | What Car? Dealerships always have cars in stock. Many will already be pre-registered, have barely any mileage on the clock and cost less than a brand new equivalent car with its discount. It's important, though, to not lose sight of what you want if salesmen start introducing different models which they say are better value. While this could be the case, there's always the danger that they're just using cars you're unfamiliar with to confuse you and get you to spend more than you should. By the time you've got to the dealership you should have researched the car thoroughly and know exactly which engine and trim you're after, why, and how much it should be costing. It's very difficult to work out all of this on the hoof with a car you're not clued-up on, and salesmen know this. If a different trim or special edition is dangled under your nose, be very careful and ask lots of questions to make sure you completely understand the deal. Our car comparison tool can help you sort the wheat from the chaff. Getting 10,000 off the list price is all well and good, but if you're only getting 10p for your trade-in it could end up not being such a good deal. These are extreme figures, of course, but they show the importance of looking at the cost-to-change and not just the discount you're getting. Improving the amount of cash you get for your old car as well as negotiating a big discount shrinks the overall cost of the whole exercise, so you'll need to research the value of your trade-in car carefully. Salesmen will furtively look in price guides for a value and then hold their hands up and say they can't do any better. The value they may show you on the page of their book, however, is much less than they'll sell the car for, so there's still some margin for negotiation. 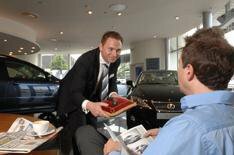 Find out how much you car is worth with our free valuations and fight for every penny. Again, this could be true, but you need to satisfy yourself on that don't believe everything you're told. Too many buyers research the cost of the new car, and the value of their old one, but leave finance to the very last minute. Salesmen can recoup much or all of the savings you've made up to this point by selling you expensive finance, so be wary. Use online comparison tools to find the best rates and apply in principle before you go to a showroom so you know the kind of rate you can get. Always use the APR figure to compare different packages and make absolutely, 100% sure that any rate a salesman quotes is the APR and not the flat rate. Using the flat rate can make a finance package look much cheaper than it actually is, so use APR all the way. Also be careful that a salesman isn't using a finance package over an unusually long period to hide the cost, or is brushing over final balloon payments that you'll need to make if you want to keep the car. You might also find that a salesman talks up a rate, disappears for 10 minutes and then comes back to tell you you've been rejected. If you think your credit history is good enough, don't just take the higher rate they then offer. Get in touch with credit agencies like Experian or Equifax to check your rating and correct any errors which may be standing in your way. Research is everything, and small changes to rates and monthly payments really add up. Make sure you know the details inside out so you can negotiate with confidence when salesmen start going through all of the credit twists and turns. Our shoppers have seen salesmen add options on at the last minute and charge full price for them. They can recoup a lot of the money they've taken off the list price earlier in the negotiations like this, and we've seen too many buyers accept the extras at face value. You can get the same percentage discount off any optional extras, however, so don't pay through the nose for them and erode the savings you've made up to now. Paint and upholstery protection treatments also come with a huge mark-up and can net a salesman a small fortune. While they can work very well, bear in mind they don't cost anything like the price they're being sold at. You can get similar protection with do-it-yourself products off the shelf, so if you're worried about spills in the cabin take a look at this. If you car is parked underneath sappy trees or those with lots of birds in them, cleaning regularly with polishes and waxes will help to preserve your paint.